TECH PLUS has micro beads larger and smoother than the old style. The new micro beads are specially coated to enhance flow ability, and to avoid (static cling) sticking to the inside of the tyre. This eliminates the need for extra powders. The larger micro beads are carefully calibrated and will not block TPMS sensor holes. A filtered valve core will no longer be required, but may still be used. TECH PLUS sizing and weight remains the same as the original beads. A nickel-plated long stemmed valve core is provided with every packet which will prevent bonding with an aluminum valve stem and will protect against air loss. It is recommended to use the valve core and valve cap provided in all applications. 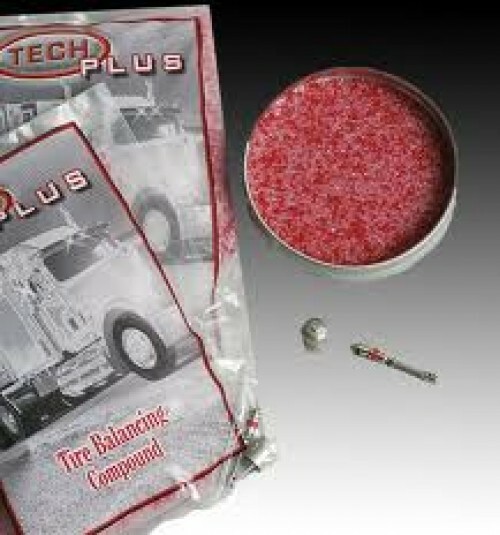 TECH PLUS also comes with a high temperature valve cap marked T+, to identify a tyre using TECH PLUS compound. TECH PLUS has a distinctive proprietary color (red and clear). Testing by an independent laboratory also confirmed that TECH PLUS micro beads flowed over twice as fast as other granulated materials, using the ASTM D 1895-90 standard for measuring the flow ability of a material, thereby demonstrating the superior flow ability of the TECH PLUS micro beads over other balancing materials.